I’d never really focused on the last verse of the chapter before. After volunteering to accept God’s call, Isaiah asks in verse 11 how long this mission to speak for the Lord is to last (which is a good question, although the timing brings to mind Merry and Pippen’s stunt in the movie version of The Fellowship of the Ring where they insist on accompanying Frodo with the Ring and only after being accepted say, “Great. Where are we going?”). God’s answer is that Isaiah is to speak until judgement comes upon the people (v-11-12). This is probably not what Isaiah wanted to hear (although I have no way of knowing and this is just informed conjecture). I know if I were in Isaiah’s shoes (sandals? ), what I’d want to hear from God would be more along the lines of “Until the whole nation repents and you are a national hero!” or “Until I call you to a different task” or even “Until you’ve faithfully obeyed me even though not many have repented.” But to hear the Lord effectively say “Obey my call until the nation is destroyed in judgement for its sins and taken into captivity and the land is mostly forsaken”? Wow…I don’t know how I’d react to that, honestly. A remnant will remain. Even in his judgement on the people who have forsaken him, God will spare and preserve some. And from this stump will come new life! (Hence the Guardians of the Galaxy reference-sorry if that’s spoilers for any of you, but c’mon! It’s been out for quite a while now.) It’s hard not to think of God’s messianic promise in the midst of cursing the snake in Genesis 3:15 that Eve’s offspring (literally seed in Hebrew) will crush the serpent’s offspring under his heel. From this remnant comes a Messiah. God’s promises have not failed, his purposes have not been thwarted. He remains faithful. What a joy and comfort to know that God is a God who-even in the midst of judgement and punishment- is in the business of fresh starts, new life, restoration, and reconciliation for his chosen people. New life from the ashes of the stump. About a month ago in a post titled “Why You Settle For Less When You Know There’s Better” on the Storyline Blog, Cadence Turpin shared a simple story about a man and a maple tree. It’s stuck with me since then because it deals with a topic and some questions that I’ve been asking during our transition from the past season of our life into the next one: dealing with necessary change. How many times have I been afraid to let go of a relationship, job or opportunity because it felt hard and I wasn’t sure if God was going to really provide something better? God is faithful. HE won’t change. He’s our sure foundation in the middle of all else. And that’s the first step: trust him. The rest will follow. You can (and should!) read the original post here: Storyline Blog. For those that read the article and/or have put some thought into dealing with change: what are your thoughts? Any insights or lessons learned? For those that don’t know, I’ve led worship for college ministries for the past six years and worship is a passion of mine. I’ve always tried to pick the songs I led with care and attentiveness to what those in the group might need and where the Holy Spirit might be leading. This tweet crashed into me like a load of bricks. I was alternating between tearing up at the beautiful picture of praises lifted up in desperate faith around a hospital bed and searching my memory for what songs that I’d led over the years might fit this description to a conviction to lead differently in the future whenever opportunities present themselves. Because, you see, all leadership involves vision (or a lack thereof). And while leading worship has the big, grand object of leading a people into an encounter with the Almighty God in a specific moment, we shouldn’t neglect practical considerations and vision of teaching and equipping either. Worship leaders, pastors, parents: are we equipping people to worship alone in the valleys as well as gathered together in the mountaintops? Are we equipping people to encounter and worship God in the quiet, desperate moments beside sick loved ones where there’s no guitar within reach and no powerpoint as well as during loud, full-band celebration services? I pray that we all are and that it starts with me. What songs that your family or church taught and sings fit this description? Are they all hymns or are there contemporary songs that fit the bill too? Sound off in the comments-I’d love to discuss and develop this more! I have recently been accepted as a student at Golden Gate Baptist Theological Seminary, which is in the North Bay Area. Classes begin next month and Lauren and I will move out that direction and live on campus. Going to seminary has been something I’ve always thought of as a possibility for myself but the timing has never been right and I’d never felt God leading that direction. However, those factors have changed recently and we’ve seen God redirect us towards this via a variety of circumstances (not all of them “easy” or “fun”). Lauren and I are excited about this next phase of our lives. Although the unknown is seriously scary and the road that’s led here has not been all smooth sailing, the fact that we can look to God through it all is a constant encouragement and refuge for us. Wherever He has put you or is bringing you: trust him. Do good, dwell there, and be faithful. He’s worthy of our trust. 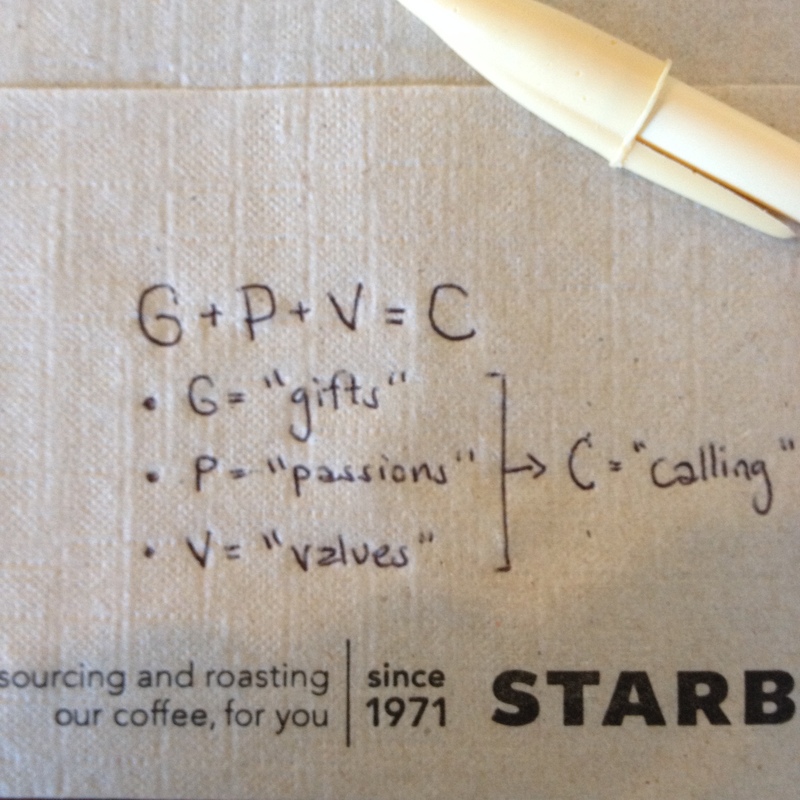 Calling: As Simple As G+P+V? These are the things we’re good at doing. Our talents or skills, natural or developed. The things you care about-that get you fired up. The preferences you have in how you do things and live life. So just figure out what you’re good at, what you care about, and your preferences in how you do them and you’re set! Done. Pretty easy, right? Maybe what you’re good at isn’t something you’re particularly excited or passionate about. Maybe you can’t come up with much that you’re good at or maybe no one does what you care about in a way that you value and would want to learn or imitate. Maybe you just have THREE more confusing questions instead of one now (“What are my gifts? What am I passionate about? What do I value?”). Maybe x, maybe y, or maybe even z! That’s a lot of maybes. A lot of uncertainty. And it can be a scary place to be. No matter what our questions might be, Christ is our certainty. Before all else, Christ calls us to himself. “Follow me” Jesus says in Matthew 4:19 (ESV, emphasis mine) to a group of fishermen about to go through some major job transition. “If anyone thirsts, let him come to me and drink,” he says to the crowd at the Feast of Booths in John 7:37. The questions of career, vocation, etc are important ones, even critical! But the first and most important question has already been answered definitively at the Cross for us. This gives us hope in the rest of the questions.